Is it legal to grow my own tobacco ? In many countries you can grow unlimited supplies for your own consumption tax free. In the UK, HM Customs & Excise are reviewing our duty on home grown tobacco. There is no duty of tobacco seeds, tobacco plants, or curing tobacco. Duty will only become payable when the tobacco leaves have been shredded or manufactured into cigarettes. HM Customs & Excise have said they will not be actively looking for home growers and when they have devised a means of collecting taxes from home growers, they will be reliant on home growers to declare that they have manufactured their tobacco. Given that 20% of all tobacco smoked in the UK is smuggled in from abroad, HM Customs could be in for a long wait. 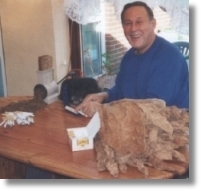 Please tell us if it is legal to grow tobacco in your country - we need world information for our new site at www.FreeSmoking.co.uk. When is the best time of year to order ? You can order at any time of the year, although ideally you should place your order at the start of the winter season. You will need to plant out at around the same time as you would normally plant tomatoes. For the USA, Canada and Great Britain, we suggest you order between November and February, while Australia and New Zealand we suggest you order between April and September. This will allow two to three months before planting out begins. For other countries seeds can be sown early spring. Manufacturers reportedly have over 600 additives available to add to commercial cigarettes and cigars. To date, very little is disclosed about the nature of these additives. Your home grown tobacco will be unadulterated and consequently safer. Will my tobacco go off ? No. You can reasonably keep your tobacco for unlimited periods of time providing you store it correctly. Like wine, it mellows with age. How do I get to smoke free for life ? The seeds produced by just one plant could ultimately sow many acres. Each pack includes full instructions on how to harvest these seeds, thereby ensuring a limitless supply of quality tobacco for many years to come. What if I need help ? All the instructions you need are included with your seeds. If you need any additional help or advice with growing your tobacco, please post a message to our tobacco forums. Members from around the world are on hand to share their knowledge of growing tobacco. There is bound to be a member from your part of the world ready to give you the benefit of their knowledge! We will pitch in with our advice too, so no matter what, you'll get all the help and advice you need! All feedback is very welcome and common questions and answers may appear in our free newsletter in order to help other growers throughout the world. If you wish to write to us, please enclose a stamped, self addressed envelope. How soon can I be smoking my own tobacco ? If you use my curing chamber made from D.I.Y store material, you could sow your seeds in March and be smoking your own tobacco as early as October. For those outdoor only smokers, you could be smoking the uncured lower leaf as soon as it drops off the plant. Is it safe to order online ? Yes. We use a secure payment gateway with real time transaction processing provided by WorldPay and approved by leading banks in the UK. These facilities use full 128-bit encryption between your browser and the WorldPay payment gateway. There is no obligation to buy once you are on the order page and you can abort at anytime prior to entering your credit card details. See our security statement for more details. Please beware of companies using inferior online ordering systems, especially those who retain your credit card numbers. Are there other ways to pay ? Yes, we also provide a printable order form which you can post to us with a cheque or postal order. Cheques and postal orders must be made out in £ Sterling. For those paying by cheque a conversion rate is shown on the credit card ordering page - you can work out how much to make your £ Stirling cheque out for from there. If your cheque is drawn on a British bank there are no extra costs, but overseas banks please add a £3 surcharge. Is there any membership ? No. Unlike many other tobacco seed retailers, we do not require any form of membership. This is a one off sale and you might get a free newsletter with any new tips that have come our way. Also if you have any photos of your crop we could include it in our newsletter if you wish. What if I don't want to smoke roll-ups ? Our instructions include information about inexpensive cigarette machines which can be used to make filter tipped cigarettes which look just like shop-bought filter tipped cigarettes. See the picture on the left. Given that this valuable plant grows more prolifically than cabbage, it is amazing that many more people do not do so. The British Department of Agriculture has certified the mother plants as virus free tobacco plants.